Welcome to our Free Spreadsheet Download Area. Here you'll find awesome spreadsheets we created to make your life easier as you research your next vehicle. These appear throughout CarBuyingTips.com, but are all collected here for your convenience. These spreadsheets cover budgets, loans, leases, used car bill of sale and making your offer to a dealer. For best results, print these spreadsheet using a color printer. Most of these spreadsheets have an "Instructions" tab at the bottom of the screen. Click on it for instructions for each spreadsheet. The best way to save these files is to right click the image or link for the file and choose the menu item "Save Target As." Some browsers will work just by clicking on the images and saving them. If you have a problem opening the file use the "Save Target As" method to download the spreadsheet. Mac and Powerbook users who are running Microsoft Office 98 or later can download and use all these spreadsheets. You may print these spreadsheets or save them to your disk under a different name, or email them to a friend, but do not post them on another site, as they are occasionally updated and improved. Please do not incorporate these spreadsheets into any product for sale, or post them claiming they are your designs, which they are clearly not. For your protection, the spreadsheets are password protected so you don't try to mess with the formulas. We delete any emails asking for passwords, so don't waste your time. You can only enter data where you are supposed to. This easy to use tool should be your first step before you consider buying a car. Do not buy a car until you fill out this budget spreadsheet and determine how much car you can afford. 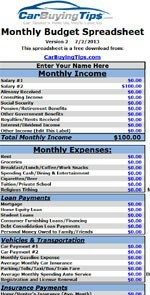 Simply enter your monthly income and accurately list all your expenses and your desired car payment. The spreadsheet will tell you if you can afford it. Choose a car payment that allows a comfortable positive monthly cash flow at the bottom line. That is your monthly cushion. Before you download: This budget spreadsheet records the last date that you saved your budget and records it in a cell near the top on the right of the spreadsheet. This is done using a macro, so you must have macros enabled in Excel for that date function to work. To enable macros in Excel, select: Tools >Macro > Security, then click on Medium or Low Security. Or, if Excel prompts you to enable macros on this spreadsheet, click on Yes. To download, just right click on the image on the left here and choose "Save Target As." It's best to enter your figures using Microsoft Excel outside of your browser window. This Microsoft Excel spreadsheet form is actually 2 forms in one. The first spreadsheet is a Used Car Bill Of Sale which takes the guesswork out of trying to figure out what information you need when transferring title of a car from the seller to the buyer. 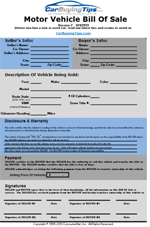 The second form is a Deposit Slip form, similar to the Bill Of Sale. The deposit slip is used as a written confirmation between the buyer and seller itemizing the selling price of the car, the buyer's initial deposit and how much the buyer still owes on the used car. The deposit buys you time while you go to the bank to get a bank draft. Requires Excel 97 or later. To download, right click on the image on the left and choose "Save Target As." It's best to enter your figures using Microsoft Excel outside of your browser window. 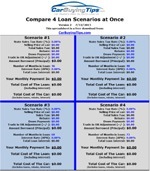 This spreadsheet compares 4 different loan scenarios at once. It gives you a summary of all 4 scenarios on a single 8 1/2 x 11 sheet of paper. The four sections are all color coded for easy use. Can't decide whether to take the rebate or the low interest rate? Want to increase the number of months in the loan? Play "what if" games with the down payment? This spreadsheet has you covered! Please Note: Some cars that are really in demand might not sell at a discount. This spreadsheet provides a good starting place for negotiations, but remember, market conditions always dictate the selling price. There is no spreadsheet for used cars. This Microsoft Excel spreadsheet helps you work up an offer to the dealer for a new car only, not used. The core strategy of this entire site comes down to this offer spreadsheet. 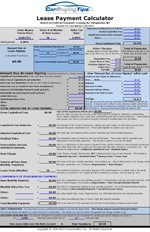 Fill in the base price and all options, rebates, incentives, destination charges, etc. from the car pricing sites that we tell you to use. The spreadsheet strips out wasted fees, determines the dealer's true cost and offers 3% - 5% fair profit above that. Print it out and take it to a dealership to negotiate or fax it to several local dealers, one of them will bite. The print area is set to print only the necessary part to fax to a dealer. To download, just right click on the images on the left here, and choose "Save Target As." It's best to enter your figures using Microsoft Excel outside of your browser window. This spreadsheet calculates lease payments. It's based on the FTC's Regulation M Model Lease form with enhancements. I highly suggest that you practice with it on an old lease. This spreadsheet will make your life much easier. The enhancements I made are the inclusion of the money factor and cells for other closing costs like dealer acquisition. Different sections are color coded for easier reading and fields to calculate excess mileage penalty. 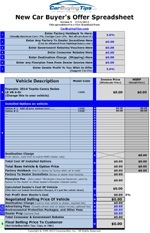 Mileage penalties are added to the total cost of lease to show you how much the entire lease will cost you. This is what dealers never tell you. Instead of cryptic cell formulas, click on any total in the spreadsheet and it names all the items that make up the total. This helps you see how payments are calculated. You can do your calculations without being connected to the internet, so bring your notebook PC with you to the dealer and check their numbers right there. Many visitors have used this spreadsheet right there in the finance office and caught dealers cheating. Of course my lease spreadsheet does have its limitations, so use real lease software like Expert Lease Pro. I thought you would like to hear this. I took your lease spreadsheet on my laptop to the dealer and plugged in their numbers right at the dealership. Doing this identified several hidden charges like VIN etching and a missing $1000 reduction in the car's price per the advertised price. The spreadsheet exposed a $60/month discrepancy which lead to identifying the hidden charges and missing discount. Ultimately the extra charges were dropped and the calculations were made to match. At one point the finance manager began questioning where I got the spreadsheet, but didn't get into questioning its accuracy. In the end, I got the best deal I think anyone could have, or at least the most accurate. Nice work on the spreadsheet and thanks for the good work. You'll notice in the lease spreadsheet I made no cell for you to enter MSRP. You never want to see MSRP listed on the lease, because you want a negotiated cap cost that is less than MSRP. Never let the dealer even use an MSRP field on the buyer's worksheet. Tell them if they enter MSRP anywhere, even for reference purposes, you are walking. My buddy and author James Bragg says that "The reason God gave you feet was to show salesman your heels." The only thing MSRP is used for is calculating the residual value. But the spreadsheet just allows you to enter the calculated residual value. Once you let the dealer write MSRP on the lease form, he has his foot in the door. The dealer can then start playing around with the numbers and fields, and gosh darn it, mistakes can occur and they charge you MSRP, even though you just spent an hour negotiating the cap cost down. The dealer might put MSRP on the form, saying he just uses it to calculate the residual, but don't let him. Tell them to calculate the residual value and enter it on the form instead. For more information on ALG Residual Values and other leasing software, see Expert Lease Pro.